Summer’s arriving soon, and you’re probably having visions of white sandy beaches and fruity drinks with umbrellas in them. 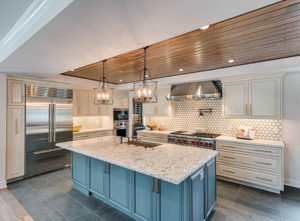 But summer is also a great time to remodel your home, not only for summertime entertaining and personal enjoyment, but also to plan for the future. Some summer remodels are strictly about amping up the fun factor in your home, while others are aimed at improving livability, and still others target ways to make your home more efficient and provide a return on your investment. Beef Up Your Energy Efficiency: Especially here in Southern California, we notice that spike in the electric bill when summer hits and air conditioning systems are working overtime just to keep you from breaking a sweat when you reach for the remote control. This is as good of a time as any to improve your home’s energy efficiency, benefitting from new technology and modern materials. From new appliances to energy-efficient windows and tightening up any spaces where climate-controlled air can escape to the outdoors, a summer home remodel can reduce the fear factor when you get that next electric bill. Turn Your Space into an Entertainer’s Space: Summer is a great time to entertain, and a well-designed remodel can transform your existing space into an entertainer’s paradise. Opening up closed-off spaces to create a more social environment, adding fresh paint, lighting and wall treatments, or updating kitchen counters, cabinets and appliances — these are among the many improvements that can make your home an exciting destination for guests. Enjoy the Great Outdoors: Who’s the most important person who should be enjoying your home? You! A summer-oriented remodel can also target your outdoor spaces, not only for entertaining but also for your own personal enjoyment and relaxation. We can add new life to your outdoor space with a new deck or patio, updated landscaping design, sleek lighting, and outdoor amenities like grills and even complete outdoor kitchens. Relatives Coming to Visit? They’ll Love Your New Bathroom: Have you ever had guests drop in unannounced, and as you welcome them into the living room you think to yourself, “Goodness, I hope they don’t have to use the bathroom”? That could be a sign that it’s time to remodel. A bathroom remodel is an efficient way to refresh a home, from new fixtures and lighting to updated mirror treatments. Prep for the Weather Ahead: Yes, the weather’s beautiful. Later in the summer, it’ll be downright hot. And, we’re notorious for our dry rainy seasons. But the reality is, stormy, windy, cold weather will return at some point, and summer is a great time to prepare your home. Upgrading insulation, sealing up a leaky roof, adding new windows, and beefing up structural stability are all excellent projects to undertake in the summer so you won’t have to worry when winter finally comes. Whether you’re thinking of building an addition or remodeling your house, Randal G. Winter Construction can help you design and build your dream home — for all seasons! Call Randal G. Winter Construction Inc. at 661.799.8089 or contact us online.